Glycemic Index, or commonly known as GI, is defined as a measurement for the degree in which certain carbohydrate-containing foods raise blood glucose. Chances are, you have heard of the term “glycemic index”, even if you do not have diabetes or monitor your blood sugar on a regular basis. Glycemic Index, or commonly known as GI, is defined as a measurement for the degree in which certain carbohydrate-containing foods raise blood glucose. The lower a food’s glycemic index, the less it will affect your blood sugar or insulin levels. Carbohydrates have not always been classified this way. In the past, they were categorized as either being simple or complex based on the number of simple sugars in the molecule. This categorizing method turned out to be too simplistic, and a more precise indicator of the glycemic response to carbohydrate intake was created. Measuring glycemic load allows you to incorporate the quality and quantity of carbohydrates in your diet. In order to better understand what the glycemic index is, it is important to learn how the glycemic index of a food is measured. According to review published in JAMA in 2002, participants are typically given a test food that provides 50 grams of carbohydrates and a control food, like pure glucose or white bread, which offers the same amount of carbohydrates on different days. Prior to eating and at regular intervals after eating, blood samples are taken to measure blood glucose levels. The changes in these levels are plotted as a curve on a graph. The glycemic index is calculated as the area under the curve after the test food is eaten, divided by the area after the control food was eaten. The value is then multiplied by 100 to represent a percentage of the control food. It was concluded in 2008 at the Institute of Food Science in Italy that when using the glycemic index concept, it is only meaningful when comparing foods within a similar food group. These groups could include breads, fruits, and varying types of cereals. 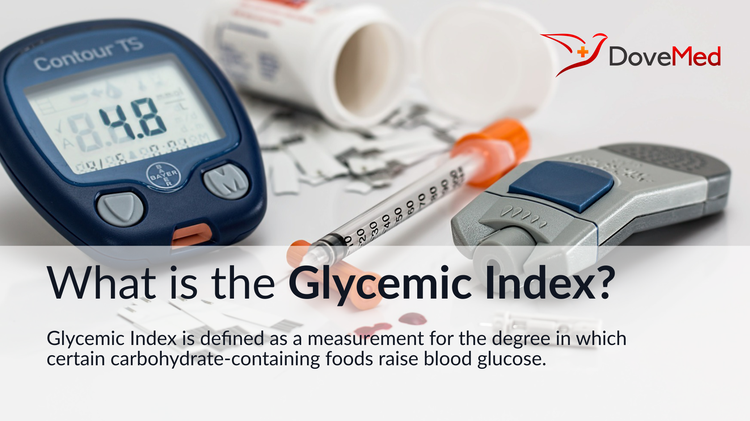 The glycemic index relates the potential of foods containing the same amount of carbohydrates to raise your blood glucose. Though, this measurement does not take into account that the amounts of carbohydrates you eat also affect blood glucose levels. Therefore, the glycemic load was created in order to be able to describe the quality and quantity of the carbohydrates in your meal. The glycemic load of a food is calculated when the glycemic index is multiplied by the grams of carbohydrates that the food contains, and then divided by 100. Patients with diabetes often monitor their glycemic index and follow a specialized GI diet in order to maintain proper blood glucose levels. Several charts exist on the internet that allows you to look up various foods containing carbohydrates to help plan your meals. These foods are ranked as a low, medium, or high glycemic index food. Using the glycemic index to meal plan allows you to choose low and medium GI foods and balance out high GI foods with low GI choices. Low GI foods include oatmeal, pasta, sweet potatoes, corn, peas, most fruits, non-starchy vegetables, and carrots. Some medium GI foods include whole wheat, rye and pita bread, quick oats, and brown, wild, or basmati rice. Examples of high GI foods are white bread, pretzels, popcorn, rice cakes, melons and pineapple, white rice, and corn or bran flakes. Do ensure that you mix high GI foods with low GI foods in order to balance out your blood glucose levels. According to the American Diabetes Association, fat and fiber often lower the glycemic index of a food. A general rule states that the more cooked or processed a food is, the higher the glycemic index will be; however, this may not always be the case. Foods with higher nutritional value tend to have a higher GI than those with little nutritional value. It is important when using the glycemic index to balance it with basic nutrition principles for healthy foods and limit foods with few nutrients. An expert can help you better understand how to incorporate the glycemic index into planning meals and maintaining normal blood sugar levels. Ludwig DS. The glycemic index: physiological mechanisms relating to obesity, diabetes, and cardiovascular disease. JAMA. 2002;287(18):2414-23. Riccardi G, Rivellese AA, Giacco R. Role of glycemic index and glycemic load in the healthy state, in prediabetes, and in diabetes. Am J Clin Nutr. 2008;87(1):269-274. Ludwig, D. S., Majzoub, J. A., Al-Zahrani, A., Dallal, G. E., Blanco, I., & Roberts, S. B. (1999). High glycemic index foods, overeating, and obesity. Pediatrics, 103(3), e26-e26.